This article takes you on a tour of the Favro interface. You will also find plenty of links to further reading so you can master every little bit of Favro. A collection is where work happens. Create collections per team, project, client, or whatever else suits your business needs. Plan and prioritize upcoming work in a hierarchal backlog. Write down your larger goals, break these down into manageable work items, and try keeping backlogs structured and short. Where work is done. Track and visualize the flow of work from left to right. By adding additional columns, you can map the board to your specific way of working. Team members pull work from the backlog and move it along the different stages (board columns) until it reaches your definition of done. The work items. Cards can contain as much or as little information as you need. More on this further down. Starring a collection (accessible from the collection name or the collection browser) saves it as a tab in the bottom bar for quick access. Backlogs let you prioritize and plan your upcoming work. It is also a great way of overviewing ongoing work by taking advantage of the table view. This lets managers and team leaders quickly see the status of items across teams and projects. The product you're building, client you're working for, the event your planning, or whatever other amazing thing your team is doing. The name should be descriptive and follow naming standards to make it easy to scale and reuse. Cards shown in a hierarchal tree view. You can drag and drop, add new cards, indent, outdent, and quickly edit all aspects of a card right from the backlog. The different fields of a card visualized as cells in your tree. Track status, who is working on the card, time spent, estimation, and more. Manage the backlog, access show options, filter items (shortcut 'F'), and more. Work boards where team members drag cards ready to be acted on. 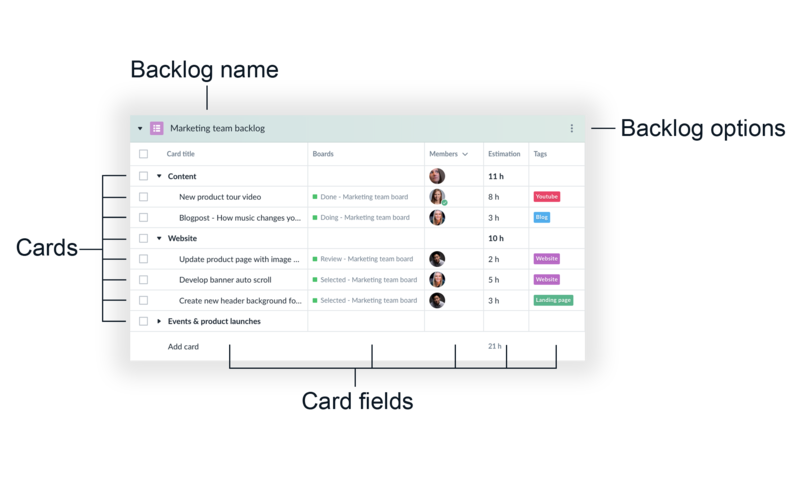 The team should be part of creating the workflow so it maps to their way of doing things. 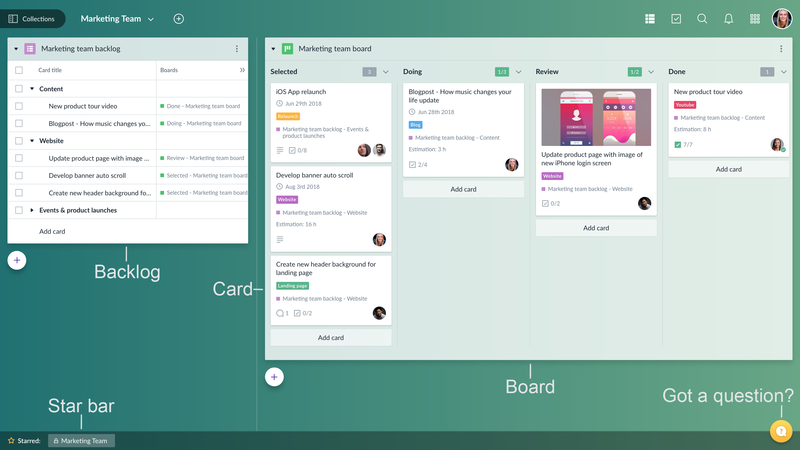 Boards can be boosted further by enabling visualizing flow with charts and implementing work in progress limits. The team, the defined process, the project pipe. The board name should reflect the work that is being done. The stages of your workflow. 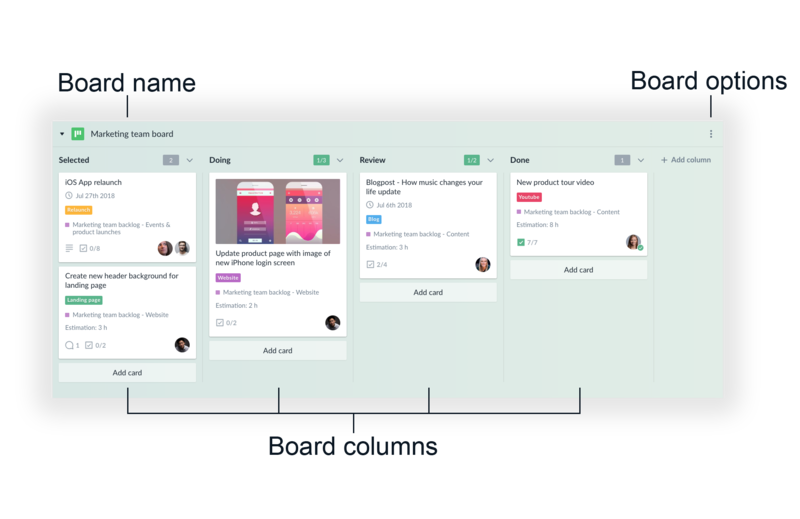 The most common use case for board columns is to map stages of your process, with the rightmost column being reserved for completed work. Manage the board, access show options, filter items (shortcut 'F'), and enable powerful apps and integrations. Cards are where all information in Favro is stored. Cards can be as detailed or as bare as you see fit. The card ID is based on your organization name and the order in which it was made. By clicking this, you can access a direct link to the card for sharing purposes. All cards have a title. For work items, this should be descriptive and easily understandable at a glance. Add further details to complement your card title. Card events are listed here (creation, movement, and so on). You also have a comments feed where you can discuss the card. @mention team members to make a notification appear for that user. Add additional data, dates, tags, assign team members, and perform card actions. For a more detailed walkthrough regarding the card editor, please refer to this article. This is where you access and create collections. 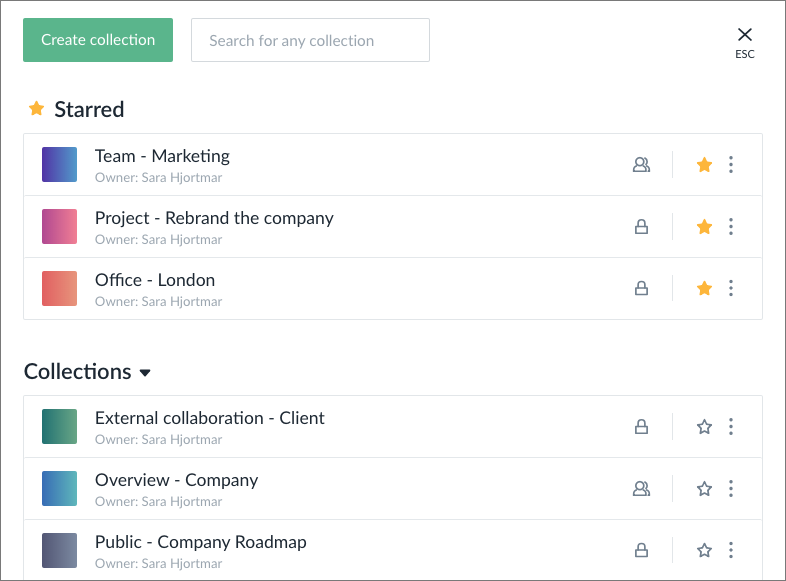 You can create collections for just about anything, like teams, departments, projects, and more. We also provide you with templates to help you get started. By clicking the collection name, you can edit the collection, add members, and invite external collaborators. The plus icon lets you add new backlogs and boards to your collection. You can also import from other tools, like Trello, Basecamp, and from CSV. Show or hide backlogs from view (shortcut 'B'). Your personal to do list. Cards that are assigned to you will show up here. Find cards across the organization based on card title or tags. You can easily access the advanced search from this menu as well. Events (card creation, movement, and so on) from subscribed to items will show up here. You subscribe to a card automatically when assigned to it, but you can also manually subscribe to cards, backlogs, and boards. Access powerful apps, integrations, reports, and group management. Manage your profile and the organization if you are an administrator. Expand your organization with more teams and projects. Browse example templates and make sure your most viewed collections are easy to access. The title says it all. 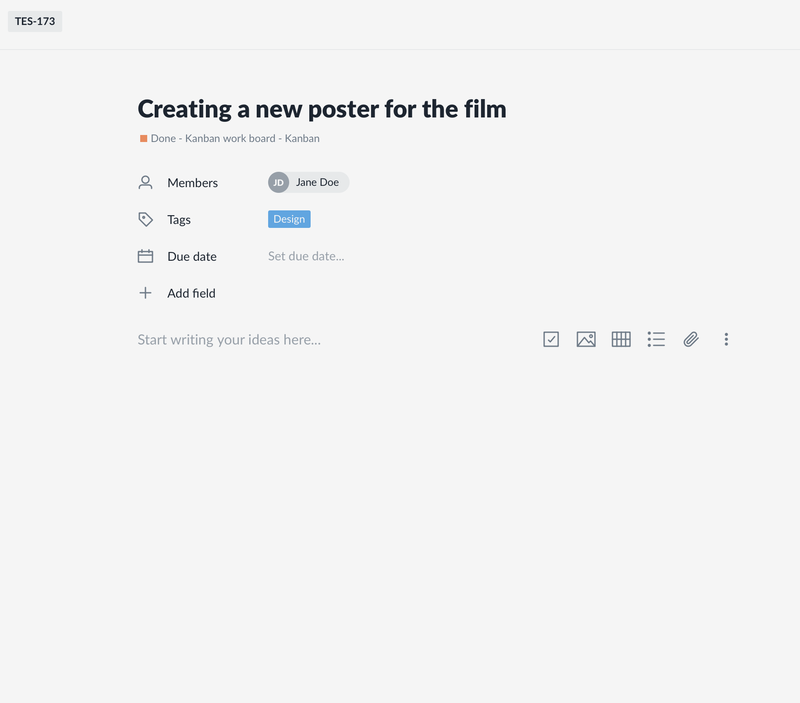 Create a new collection to set up a new team, department, or project. Don't do it all from scratch, use one of our many templates to get up and running even faster! Working in a large team? Find the collection you're looking for here. Starring collections put them at the top of your browser and adds them to the star bar in the collection view. Make sure to do this for your most used collections. All un-starred collections. See who owns it, check visibility, star the ones you need, and manage them right from this view.